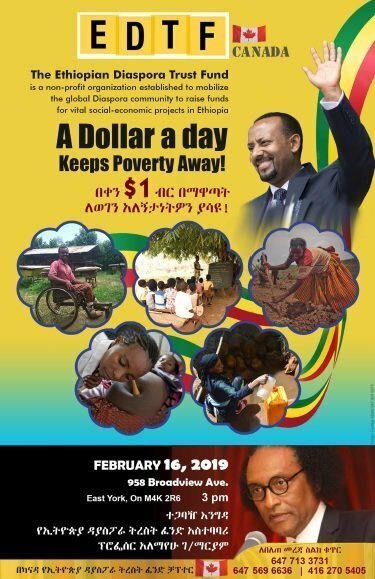 Ethiopian Diaspora Trust Fund (EDTF) is a non-profit organization established to raise funds for vital socio-ecoomic projects in Ethiopia. EDTF Canada chapter has organized an event on February 16, 2019. Professor Al Mariam, EDTF coordinator, is a keynote speaker at the event. Editor’s Note: If you are organizing a community event(cultural, social, entertainment or otherwise) and would like to share it with borkena audience in different parts of the world, we could feature your event in the events section and share it on social media plat forms. Do send us the information. It is a free service!